Home › Toys › Set Of 144-Jumbo Enlarged Oversized Replica Fake Play Money-Assorted Denomina..
Set Of 144-Jumbo Enlarged Oversized Replica Fake Play Money-Assorted Denomina..
Set of 144-Jumbo Enlarged Oversized Replica Fake Play Money-ASSORTED DENOMINATIONS in Black and White-Single Sided Play Money. SINGLE SIDED- ONLY PRINTED ON 1 SINGLE SIDE. 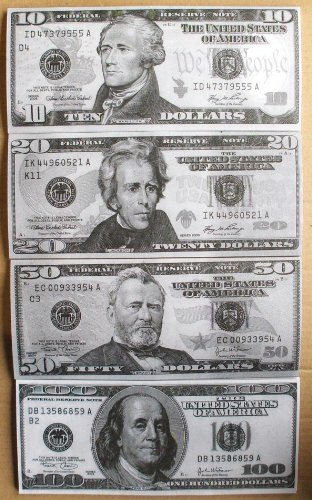 These replica novelty play money bills are printed on one side. BLACK AND WHITE INK ONLY-These bills are printed in black and white ink only. SAVES YOU TIME-If you were to print these bills at home you would have to waste all your ink and then go through the big hassle of cutting them down to size. EDUCATIONAL PRODUCT- These Over-Sized Jumbo Novelty bills are great for teachers, seminars, students and presentations. EACH PIECE IS 4 X 10 INCHES Great for education resale or use in promotions.Each gross of 144 bills comes as shown. Printed on 1 side only. 1 GROSS = 144UNITS ASSORTED BILLS IN EACH GROSS. Use the jumbo school play money sets toteach students about math, the presidents and other Historical relatedmatters.